DESPITE BEING LINKED with big names like Ajax boss Frank de Boer and Lyon’s Remi Garde, Newcastle have decided to stay with what they have for the time being. The club have appointed interim boss John Carver as manager until the end of the season. “This is a proud day for me,” Carver said in a Newcastle statement. “I have worked with, and learnt from, the best manager that this football club has had in Sir Bobby Robson. I know what this club means to this city and its people. I believe in my players and the staff I have around me. 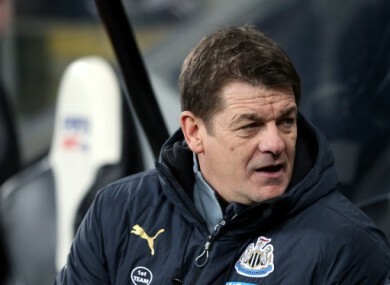 Carver’s first match at the helm saw Newcastle draw 3-3 at home to Burnley, a match where they lost the lead three times and they have since been beaten in their three subsequent fixtures. After flirting with some impressive managers, Newcastle fans were pretty disappointed that the club opted for Carver in the short term. John Carver has had the desperate eyes of a man who knows he's in too deep for a while now. I fear for him. The 13th largest club in Europe by attendance and 19th by revenue managed by John Carver. Read that back to yourself. Then open the whiskey. Carver is unlikely to stay on past the end of the year but Spurs fans probably thought the same when Tim Sherwood initially came in, but he was given a two-year deal after a few good results and it ultimately proved unwise. Email “Newcastle have appointed a manager until the end of the season but it wasn't a very popular choice”. Feedback on “Newcastle have appointed a manager until the end of the season but it wasn't a very popular choice”.